Our arrival at Sousse saw us fighting traffic and a seeming total lack of signage to try to find the Maison de Jeunesse. These institutions are government run, and provide a mix of extra-curricular education for kids and cheap/cheerful accommodation for travellers. Our first night in the country was spent at a similar establishment, but that was much more like a rough-and-ready campsite. This resembled nothing much more than a sprawling ’60s urban school – but they were happy to have us kip in their car park and use their showers and loos. Once installed, we unloaded the bikes and headed off round a massive one-way system through the main “zone touristique” of the city. Hotels and restaurants of wildly varying levels of flashness, salubriousness and closedness lined the road, but we were soon at the heaving main square which marks the edge of the Medina and the main hub of the city. A real mix crowded the square – everything from mobile exhibition stalls for each of the three mobile phone networks to a slightly scruffy houseware and clothing market, via the ubiquitous tourist tat. As we headed in to the Medina itself, we were soon reduced to just one of those – yep, the tat. The hard-sell here seemed to be more marked than Kairouan or Tunis, and as we headed along the main passageway through, we were hailed in most major European languages by shopkeepers. After a short wander around the inside of the walls, though, to find that the museum in a tower-fort is still closed for restoration several years after our guidebook suggested it was due to re-open, we headed back in on a different passageway – and the whole feel changed completely. No tourist tat, no hawkers – just a feel of being in a proper “locals’ area”. The shops were completely different, selling gold jewellery, clothing and other items aimed at residents. Other doorways opened onto small workshops containing cobblers and other artisans. A food cart provided us with a delicious “chapatti” – nothing like the eponymous Indian flatbread, but a round leavened bread toasted and filled with a made-to-order herby omelette, salad and harissa. 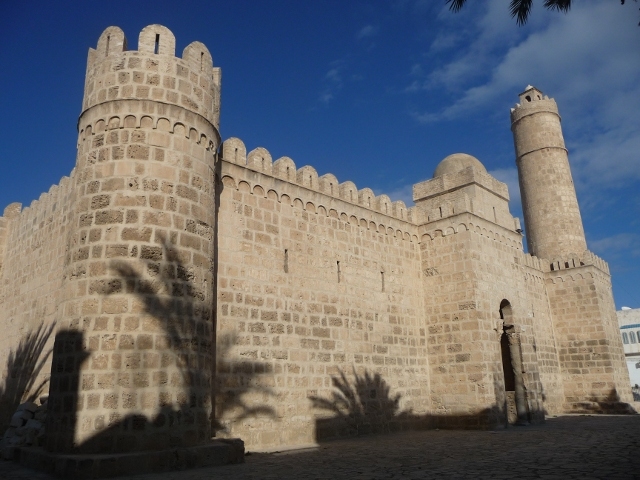 As we wandered back to where we’d left the bikes, we stopped in at the Ribat, the old fort and barracks on one corner of the Medina – a wonderful shell of a building, with great views of the town – including the lovely and unusual fretwork-like minaret of one of the nearby mosques. 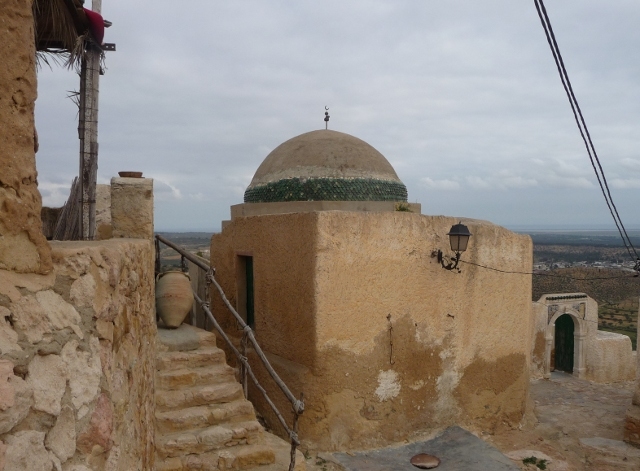 The next day, we headed out to a couple of villages north of town – Hergla, with a wonderful old centre on a small rise overlooking the sea, which seems to be surviving unscathed despite the outskirts expanding massively with hotels and apartment buildings. The village has long been the centre of weaving a coarse grass into filters for olive oil pressing – and, of course, has now developed that into a tourist trade. However, it’s done so in a very low-key way, retaining dignity and integrity. Many of the women in the village were dressed in colourful and flowing traditional costumes, including those running a couple of small shops on the main square. We couldn’t resist adding a few of their woven items to the van’s interior – a hanging pot for keeping veg in, and a colourful fish to protect us against the evil eye. Don’t ask why, though, but we seem to have taken virtually no photos! Our next stop, Takrouna, was a small village with an old centre occupying a tiny outcrop on top of a large rock. We’d seen postcards, and it looked fantastic – but our guidebook dismissed it with a slightly scathing comment about it being ruined by tourgroups, with the attitude of the residents being a mix of hostility and opportunism. We found nothing of the sort. It’s a fantastic location, far far smaller than we were expecting. There’s not very much at the top, once you’ve wound your way up the steep access road – just some rough pathways straight onto the rock, a couple of ramshackle houses, and the ubiquitous shrine. We were greeted with enthusiasm and curiosity by the guys hard at work on a retaining wall and on restoring the shrine – they stopped work for a chat, insisted we took photos, and seemed generally delighted to see some visitors – with no hassle or pressure to buy anything at all. After another night in the car park, we headed down the coast – but not before stopping off at a private contemporary art museum in the house of a local artist. As we pulled up near a long line of plastic chairs lined up along the pavement, we were greeted by the son of the artist with the bad news that they were closed for the day due to the death of a neighbour – the chairs being for visitors and mourners to sit in whilst paying their respects. Our disappointment was short-lived, as the artist – Taïeb Ben Hadj Ahmed – said it was OK for us to come in. I’m not quite sure what we were expecting, but this definitely wasn’t it. 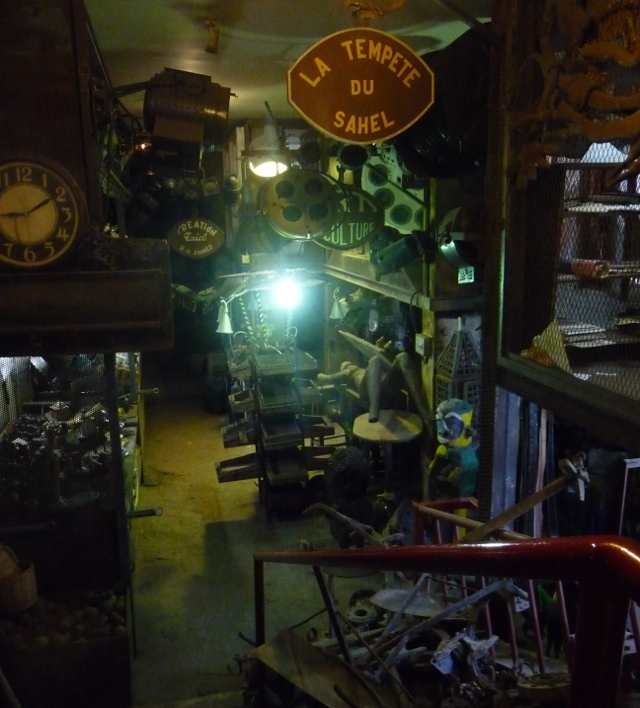 It’s not really a museum or gallery as such, more of a cross between a house/workshop and Aladdin’s cave. 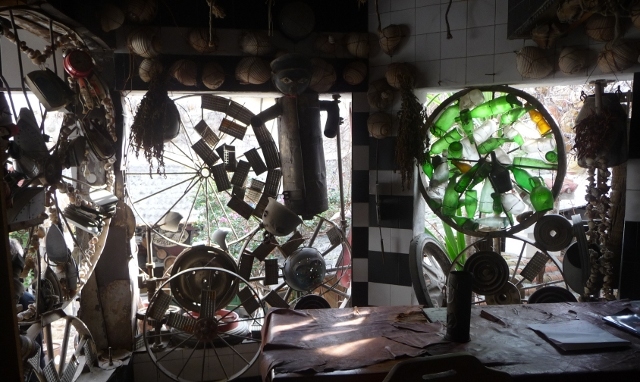 Room after room, courtyard after courtyard is _rammed_ with artworks made from all sorts of recycled materials, together with items which may one day be used in other works. 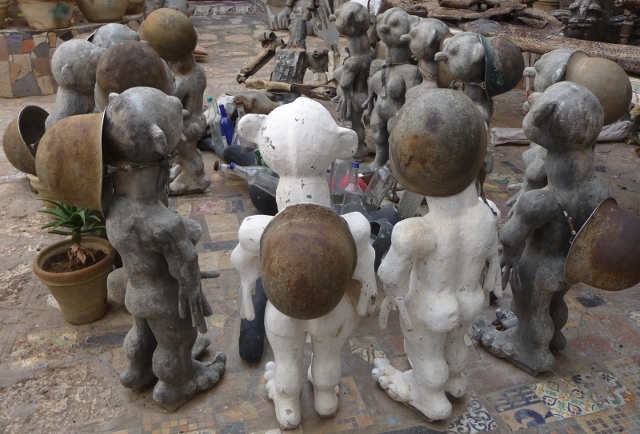 Beautiful abstract marble sculptures sit next to a line of caricature people made from old gas bottles, next to a circular staircase made from old bicycles. We were guided through, and just stared open-mouthed as we rounded each corner or passed through doorways lined with hundreds of household electricity meters or sunglasses or watches. 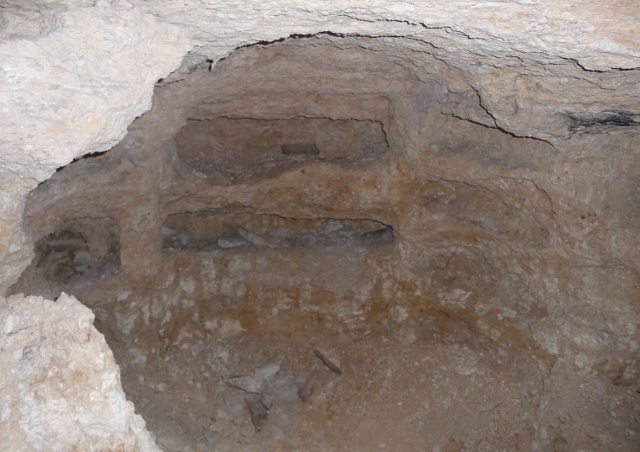 Monastir, just down the coast, was another disappointing tawdry mess of a tourist resort. 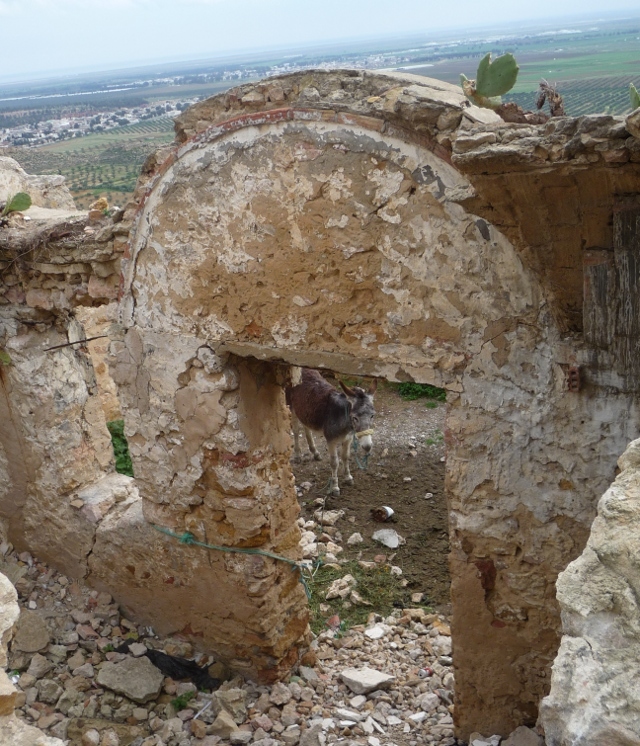 It was also the birthplace of Habib Bourguiba, the first president of Tunisia after independence from France. Deposed in a coup in the late ’80s by Ben Ali, himself ousted in last year’s revolution, Bourguiba’s fondly remembered by many Tunisians, it seems – we’d had a chat with the caretaker of the Maison de Jeunesse in which he explained some of the reasons and the failings of Ben Ali, whilst lauding Bourguiba to the skies. 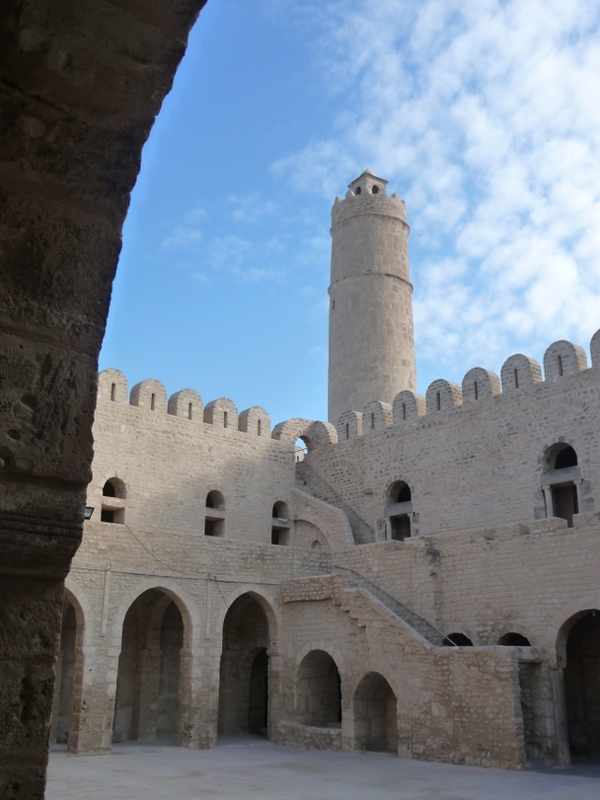 The presidential mausoleum is just off the centre of Monastir, a luxuriant mini-palace with two huge minarets and a golden dome – very impressive, and adding to the theme-park like feel of the rest of the centre of the town (but more positively!). 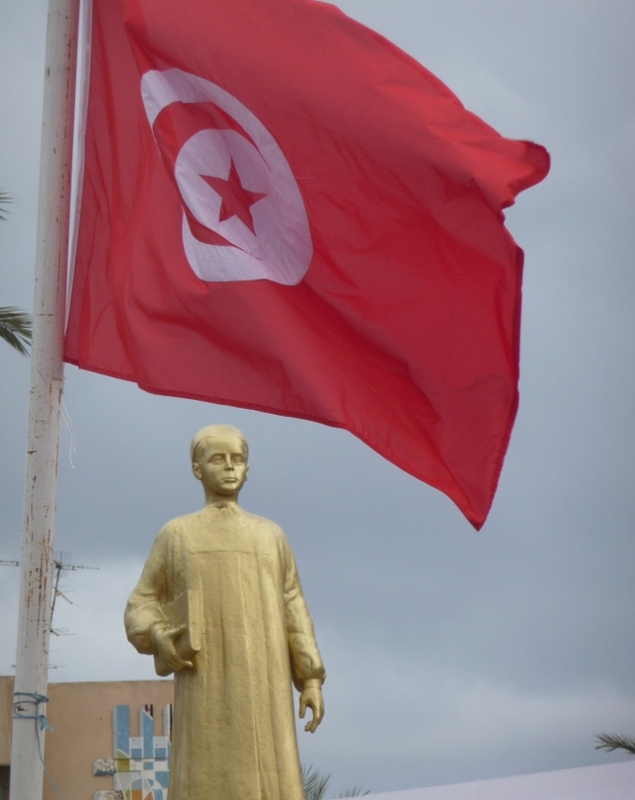 There’s also a tacky golden statue of a school-age Bourguiba, celebrating his school days in the town. Fairly quickly, we were on the road again, heading down the coast towards Mahdia. 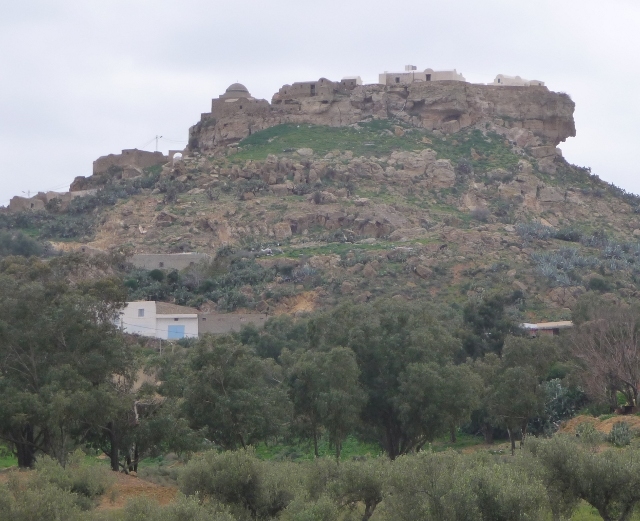 Monastir had seriously dampened our expectations – and the darkening skies weren’t helping much. This entry was posted in Art & Culture stuff, By Country - Tunisia, Travel stuff. Bookmark the permalink. hello my dear freinds !truly when you are going , my wife and me we remember allways to you end we see your travel pictur’s in your’s site. we think that it’s a good hollyday’s we are recive two couples a germens end a netherlands people, thank you very much. i hoop that you spend a very nice teame here in tunisia end we hope that we sea you a gain good by…. Great to hear from you, and we hope that all is good at El Kahena. We’re very happy that some of our friends have found you – and we know that the two from the Netherlands enjoyed your warm welcome.